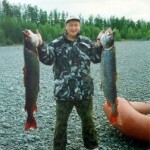 The large number of rivers and lakes in the taiga and in the mountains, and a variety of beautiful places along their banks, combine to make fishing in Yakutia very enticing. Fishing lovers will be impressed by the variety and types of fish, some of which are very unique and valuable. In mountain lakes there are red fish, malma (salvelinus lepechini), eel-pot (lota lota), and grayling (thumallus vulgaris). In rivers there are white salmon nelma (stenodus lencichthys nelma), omul (coregonus autumnalis), chir (coregonus nasus), taimen (hucho taimen), pike (esox lucius), and sig (coregonus). Many of these species are very delicious. The purity of the taiga, rivers, and lakes, together with snowy mountains and fresh air, combine to make fishing in Yakutia a fisherman’s paradise. Experienced guides are happy to assist tourists and travelers. They can give all necessary information about the traditions and customs of indigenous people. Fishing: spinning and casting. Transport: bush plane (Antonov 2), helicopter. Accommodation: hunters cabins, tents. 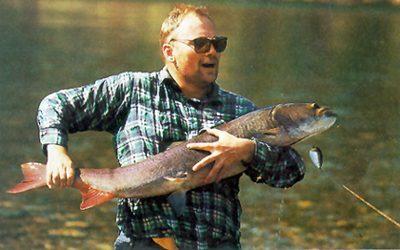 Siberian Taimen – this big Asian salmonid is known to weigh over 150 pounds. It is not anadromous, living in rivers where it feeds as an active predator. The taimen is one of four species in a genus of strictly freshwater Eurasian salmonids, remotely similar to the Atlantic salmon, with a proportionally larger head and adapose fin. His mouth is huge, with strong, canine-like teeth canted slightly back into the throat and the jaws are very heavy. Coloration is attractive, with dark, pea-sized spots arranged in Xs on a gray background. The tail is bright red and the fins are gray, like the body color. 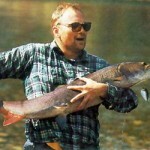 The taimen is a legendary fighting fish among Russian anglers. They say that on the first run they may take 250 feet of line from your spool, with a high-speed run that is virtually impossible to stop. 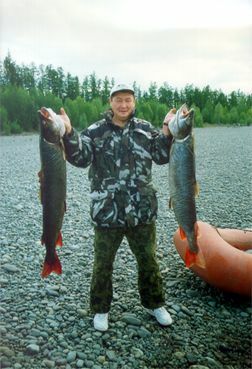 When Siberian anglers really get going with their tales fueled by a little vodka, they say that the really big taimen can only be caught by shooting them with a shootgun when they jump – or by baiting a large hook with a muscrat, tying the line to a birch sapling, and letting the fish play itself out on a tree – if the roots hold!